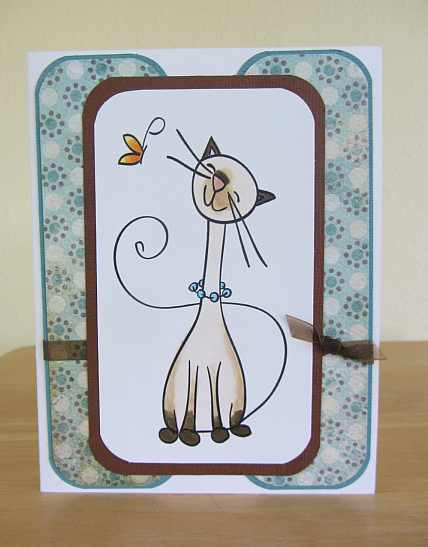 I made this card with the first image in this round of the Crafter’s Digital Art Center’s Progressive Challenge. The digital “stamp” was created by Tiffany Doodles, and I colored it with Copic markers and added some sandpaper for the sand. 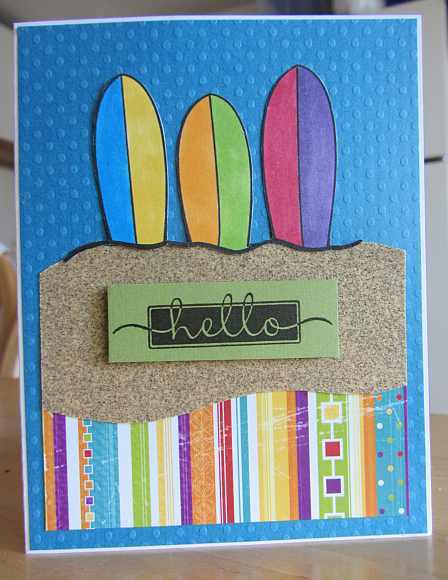 Just a fun card that will be shipped off to OWH so that a soldier can send a bright “hello” to someone. Thanks for visiting. 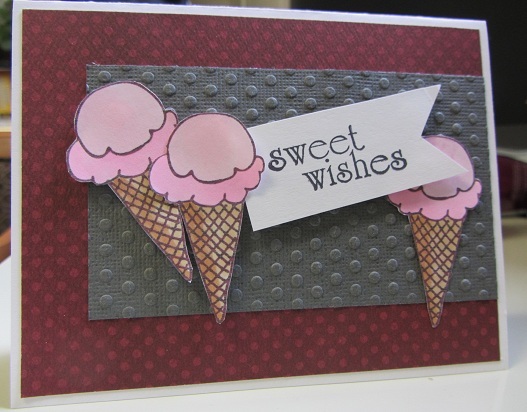 The ice cream cone digital stamp is from Pattie’s Creations, via Crafter’s Digital Art Center’s Progressive Freebie Challenge. I printed and colored three of them with Copic markers and popped them up at different levels. Just a very simple card today. Thanks for visiting. 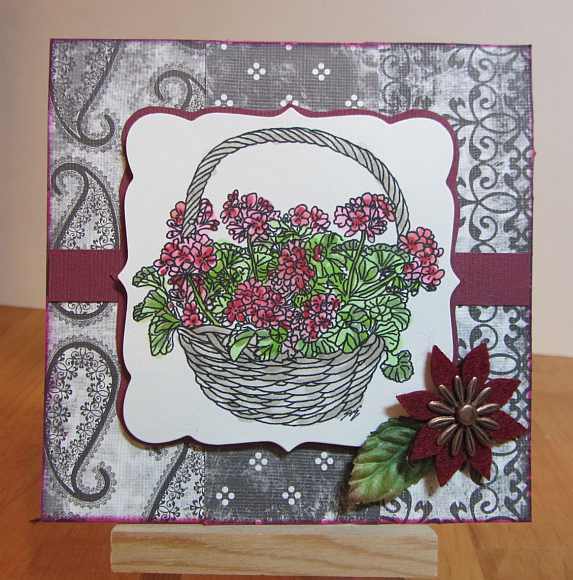 I used Card Patterns Sketch #165 as inspiration to design this card. 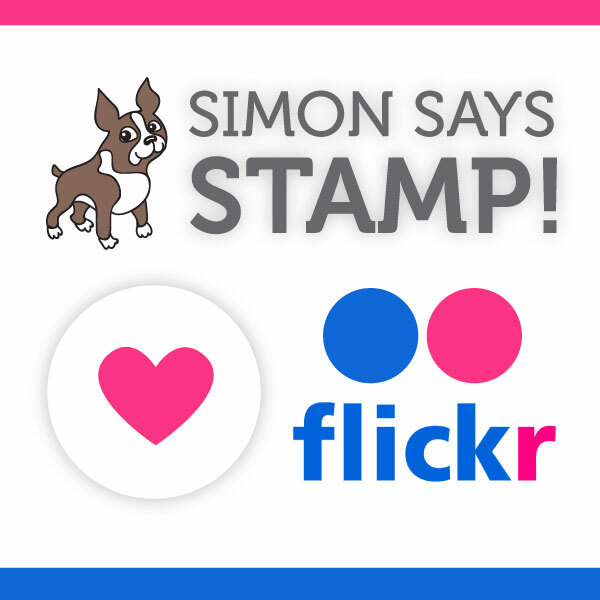 The digital stamp came to me by way of the Crafters Digital Art Center’s Progressive Freebie Challenge. I colored it with Copic markers with bright and pastel colors. Thanks for visiting today. It is such a busy time right now, my posts have been few and far between! Button Candy Dots – Pebbles, Inc. 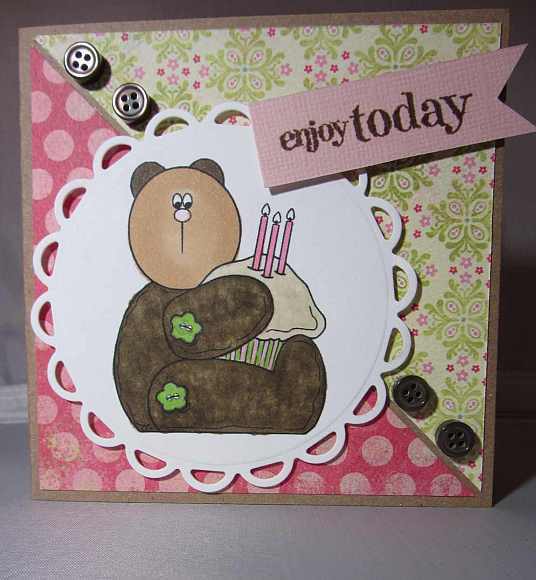 I used the Card Patterns Sketch #161 for this card, which features one of the bear images from the latest challenge. 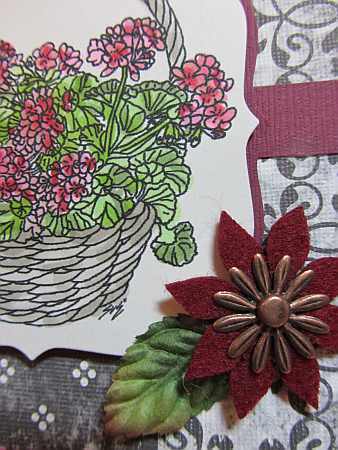 I used an image from the current Progressive Freebies Challenge at Crafter’s Digital Art Center. This is a festive birthday card that I’ll forward on for Operation Write Home soon. Thanks for visiting today. Paper leaf – Prima Marketing, Inc. 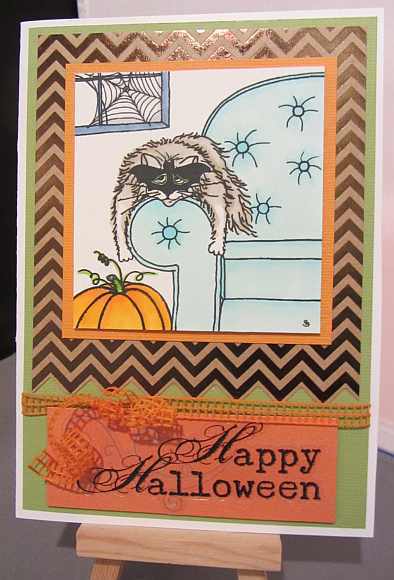 This card features a digital image by Ike’s Art that I got by participating in the Crafter’s Digital Art Center (CDAC) Freebies Progressive Challenge. I colored the image with Copic markers. 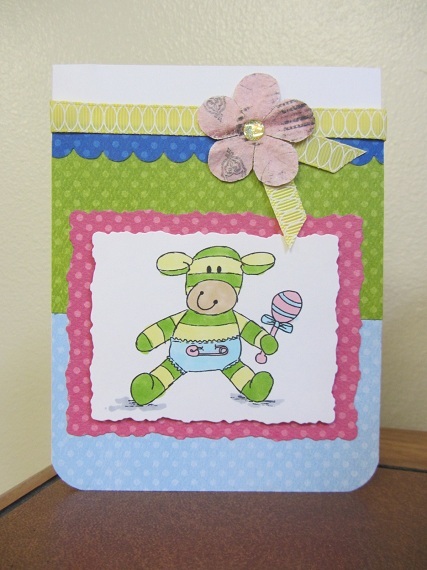 The card design is based on the current sketch at Mojo Monday: Sketch #234. I created it in response to the March ODBD challenge at Operation Write Home Stars and Stamps, which is a “Tic-Tac-Toe” challenge where I had to pick three in a row from elements on their game board. As it turned out, I managed to get two different lines of three in a row: Brads, Digi Stamp, Die Cut and Die Cut, Layers , Stripes. This was a really fun idea for a challenge! Thanks for stopping by today! Above is a closer look at a couple of this card’s details.